I wanted to say it when I emerged from the depths of Sydney Harbor. But I didn’t. It was rainy and gray out, the waves had gotten stronger while we were underwater. I was rather disoriented from my very first ocean dive. The waves were strong. The surge beneath the surface tossed me back and forth. My lips felt swollen, raw and salty, like I'd eaten way too many potato chips. I learned how to dive during my study abroad year in Sydney my junior year of college. In that year I attended Macquarie University. During my foreign student orientation I sat in a large room filled with international students. I was handed a catalog that contained a list of all the clubs on campus. Macquarie is a large university, way bigger than the microscopic business college I attended in Rhode Island. Bryant, my alma mater, didn’t have many clubs that were designed for fun, like Macquarie did. At Bryant we had clubs where students could do things like run a business. At Macquarie they had clubs where you could learn how to go spelunking, or hang gliding. I turned the pages of the catalog, it had dozens of pages containing all the clubs. I circled all the ones I was interested in joining, based on activities I was interested in learning how to do. There were a lot of circles in that catalog. In one year I wouldn’t have enough time to join all those clubs and meaningfully participate. So I had to narrow it down. I crossed off hang gliding, for fear of crashing into a face of a cliff. I deliberated and drew another X and another and another. I settled on joining the Macquanauts. It was the scuba diving club on campus. I read in the description that I’d get certified, and then I could use the rental gear stored in a locker on campus. I remember at the time this cracked me up. 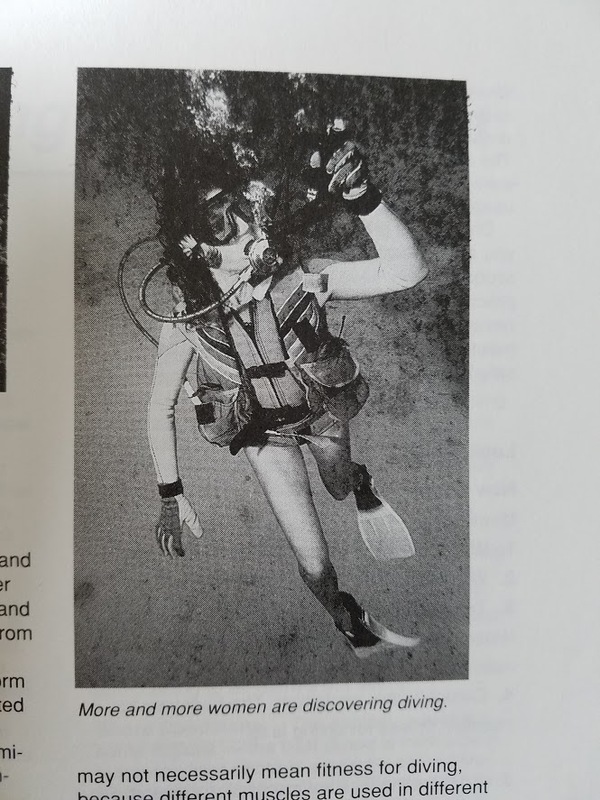 It was interesting to me that in 1994, when I got scuba certified, that the text book would still need to call this out that women enjoy diving too. It's like, do men take scuba lessons and then consider for the first time when they see this picture, "Oh yeah, maybe I could do this with my wife. I didn't even think of that!" Wow! Women enjoying scuba diving in the 90s. Who would have thunk? We went to complete the first day of ocean dives. Four open water dives are required to get a scuba certification. I rented a wet suit, a regulator and a BCD. I bought fins and a mask. But I didn’t know about boots. I walked barefoot on top of the rocks to perform a giant stride off the rocks into the water. The barnacles on the rocks painfully dug into the soles of my feet. I fixed my mask on my face and stepped off into the water. The waves tossed me against the rocks, until I was able to get my bearings and swim away from them. Strike one for the new girl. We descended. The thing about big waves on the surface is that underwater it’s surge. Through the whole dive I swished back and forth. I tried to navigate, and was tossed left then right then left then right all through the dive. The instructor gave me and the other students the thumbs up and we all headed for the surface. We swam back toward the rocks to make our exit. As I attempted to climb out, a wave rushed at me and effortlessly tossed me into the rocks. I bashed my knee into the face of one of them, I felt the jolt of pain through my wet suit. I still have a calcium deposit in my knee, and still feel the tiny pea sized lump to this day. I crawled up on top of the rocks and picked my way, barefoot, back to the shore. I peeled off my gear and skimmed the parking lot for a bus stop sign. I wanted out. There was no way in hell I’d do the second dive. I had gotten a ride from one of the other students. There was no bus stop. We piled into the cars to go to the second dive site. The drizzly gray rain continued, I harrumphed from the back seat of some guy’s car. We arrived at the second site. The sun started to break through the clouds. I donned my gear again, and figured I’d just finish out this day and never go diving again. I licked my lips, still swollen and salty from the morning dive. This time we’d do a beach entry. The water was calmer at this site. I wasn’t sure about the geography, as I hadn’t bothered to consult a map like I normally would—seeing as how I wasn’t going to stick around. I strapped my fins on to my bare feet once I got into the water. Then I backwards walked into deeper water, until my feet didn’t touch, and the air in my BCD kept me on the surface. We put our regs in and the instructor signaled thumbs down. When I descended I noticed the underwater world looked completely different. The sun filtered through the water and illuminated the tiny specks of sand swirling around in the water; it caused the water to shimmer as if someone dumped a jar of glitter into the sea. I knelt down on the sandy bottom and me and the other students arranged ourselves in a circle around our instructor. When I tried doing this on the morning dive, the surge kept pushing me back and forth, I was unable to kneel in one place. The instructor demonstrated the skill he wanted us each to demonstrate. When you get scuba certified, you have to demonstrate that you know how to use your equipment underwater. I had to take my reg out of my mouth toss it over my shoulder and then demonstrate I could find it again. I had to take my mask off and put it back on. I had to clear my mask and also demonstrate I could hover weightlessly over the bottom of the sea. Taking my mask off underwater is something I am not at all comfortable with. I don’t know how I managed to complete it on my second dive. After we demonstrate our abilities, we got to have free time. We swam to a pile of rocks to observe the fish nearby. A large fish loomed over the top of the rocks, its mouth could easily fit a tennis ball in it. My heart raced at the sight of this gigantic creature, I later learned it was a harmless blue grouper, came toward me and the other students to investigate us. Our instructor pulled his knife from its sheath on his ankle. At that moment, when I didn’t know the fish was harmless, I wondered if the instructor would stab it to defend us. Instead the instructor picked up a sea urchin nestled on the side of a rock. He cleanly sliced the urchin in half, and fed the insides to the grouper. He handed me the other half. I held it by the spine and held it out to the grouper, as far as my arm could reach. I don’t know why I thought this. But I thought the fish would somehow grab it. So I let the urchin go, only to watch it fall to the bottom. Another student grabbed it and held it while the grouper ate the inside. We checked our air gauges and headed for the surface. The ambient light grew brighter as we ascended, and the glittery silt effect was happening again. We broke through the surface and I felt the sun on my face. And it was then that I understood. Yes, people do scuba dive for fun. And it is very very fun.